Just this weekend, I read again about the after-effects of the terrible tsunami that devastated northern Japan last year. I find it hard to grapple with these images, and so I shied away from reading Tsunami! illustrated by the amazing Ed Young for several years. But I recently read this and think it will fascinate children, without terrifying them. I was really, truly impressed by the way both author and illustrator shared this story of bravery and courage. Long ago in rural Japan, a grandfather was tending his rice fields high on a mountaintop overlooking his seaside village. That day, his family went down to the village to celebrate the rice harvest, but Ojiisan, the grandfather, told his family that something did not feel right. So he and his grandson Tada stayed behind on the mountain. Later that day, an earthquake struck, “a long, slow, spongy motion.” But earthquakes are common in Japan, and this earthquake was not strong enough to alarm anyone. Ojiisan, however, was unnerved by this earthquake - it felt different from the many others he had felt. He turned to look down toward the village -- the sea was running away from the land! 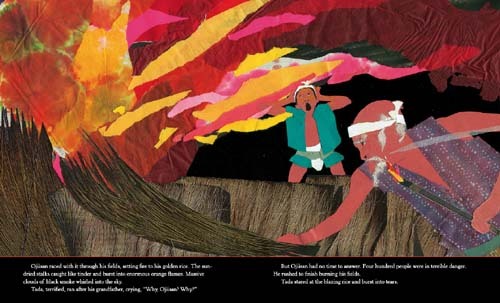 Remembering his own grandfather’s warnings, Ojiisan whispered to himself, “Tsunami - the monster wave.” All of Ojiisan’s family, all of the villagers were in danger, but they were too far away to hear Ojiisan’s cries. What could he do? How could he signal to the village? Kajikawa shares this story with straightforward language that will engage a young audience. Kajikawa’s pacing works perfectly for a picture book to be read aloud. While the drama is exciting, it is appropriate to share with young children. No one is injured in the tsunami and, while the village is destroyed, the focus is on Ojiisan’s bravery and quick thinking. Ed Young’s textured multimedia collage illustrations draw in the reader from the very beginning, taking up the vast majority of the large pages. The text is limited to the bottom two inches of every page, letting the eye feast on the dramatic illustrations. Young balances realistic period details with abstract images in a way that makes it interesting for young readers without making the events too realistic or frightening. Children will be fascinated figuring what parts of the collage use photographs of real things like straw for the fields. Young’s dramatic use of color and diagonal lines add movement and heighten the tension in the scenes with the fire and the tsunami. I enjoyed reading an interview with Ed Young over at Seven Impossible Things Before Breakfast. As Jules writes, "If I were asked to name a contemporary illustrator whose works provide a truly exciting visual experience, no matter the book’s tone, Young would be the first to come to mind.Whether he’s using the bold, bright collage of a book like The Emperor and the Kite (written by Jane Yolen and published in 1967) or bringing us ethereal impressionistic paintings, such as in 1989’s Lon Po Po: A Red Riding Hood Story from China, it’s always dramatic. Always striking. Always infused with an elegance. You look at his illustrations, and you can see the poet in him." I particularly liked reading about the heart and spirit that Young sees infusing each of his books - each person who's touched the book in the process of development finds a home in the book. The review copy came from our home library. If you make a purchase using the Amazon links on this site, a small portion goes to Great Kid Books (at no cost to you!). Thank you for your support. 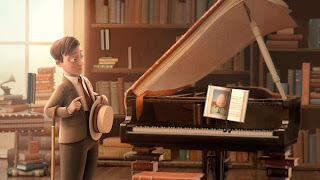 The Fantastic Flying Books of Mr. Morris Lessmore won the Oscar for best animated short film last night at the 84th annual Academy Awards ceremony. William Joyce, with his Moonbot Studios, is forging a path telling stories across multiple platforms: animated movies, interactive book apps, and traditional print books. The Fantastic Flying Books of Mr. Morris Lessmore is an ode to the imaginative power of stories, the magical way that books feed our soul and lift us up from our everyday surroundings. I am thrilled that it was recognized by the Academy. William Joyce and Brandon Oldenburg, his co-founder of Moonbot Studios, have had a long collaboration in film. 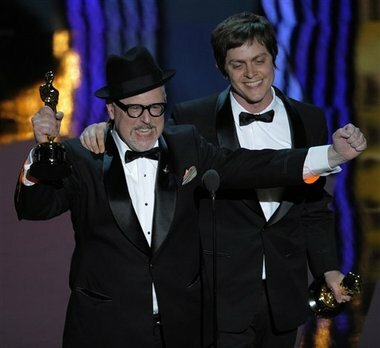 Here they are accepting the Oscar for The Fantastic Flying Books of Mr. Morris Lessmore. Joyce and Oldenburge are currently co-directing The Guardians of Childhood, an animated feature for DreamWorks. Joyce has written picture books and chapter books for the Guardians of Childhood series. The Man in the Moon and E. Aster Bunnymund and the Warrior Eggs at the Earth's Core! have both gotten very positive reactions from my students. 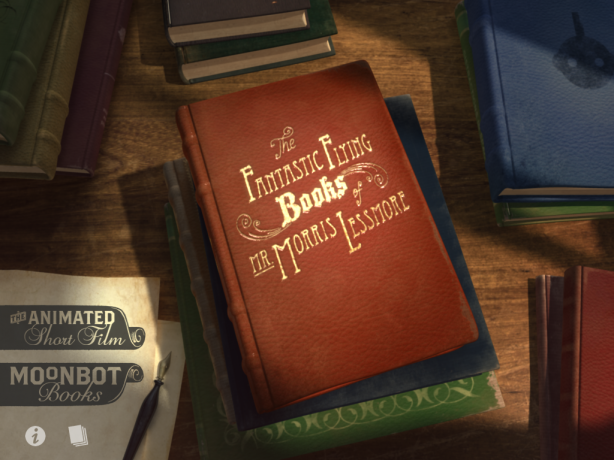 The interactive book app for The Fantastic Flying Books of Mr. Morris Lessmore was a finalist for the 2011 Cybils Book App award. I reviewed it last summer for the School Library Journal blog Touch and Go. I'd love to share that review with you here. 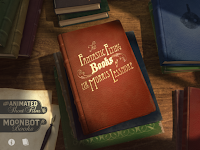 "With a stunning combination of computer animation, interactive features, and traditional picture-book elements, William Joyce and Moonbot Studios have developed an enchanting story about the power of books. Based on their award-winning short film, this production sets the bar high for picture-book apps. Joyce combines his background as a filmmaker, an illustrator, and an author to create a groundbreaking storybook app. The production flows seamlessly between a combination of media, with effective well-paced page turns. While the short film in the beginning of the app is silent, the writing is graceful and eloquent. In the end, what makes Morris Lessmore a story that readers will come back to again and again is the way it which it affirms the power of books to speak to us and carry us away." This book app continues to enchant students at our library - ranging from kindergartners through 5th graders. They are drawn in by the blend of animation and the interactive features - it really does strike them as something completely new. And yet they are held by the magic of the story, the way that it strikes a chord so familiar to them, even with this new way of telling a story. I'm fascinated by the way that William Joyce, author of such classic favorites as The Leaf Men and George Shrinks, is developing his new stories. He released Morris Lessmore first as a film, then an app - and this summer it will be published as a traditional picture book. And I think this will definitely work. These are all intertwined ways of enjoying a story, and children will want to experience the app and the book in different, complementary ways. You can download the silent film from iTunes, and the app is also available on iTunes. The review copy of the app was kindly sent by Moonbot Studios. If you make a purchase using the Amazon links on this site, a small portion goes to Great Kid Books (at no cost to you!). Thank you for your support. I've had a great time this week introducing mysteries to 3rd graders. Reading mysteries is such fun, but it also sharpens your reading skills - getting you to notice clues as you read, pay attention to character's motives, and making predictions. All of these are important skills. 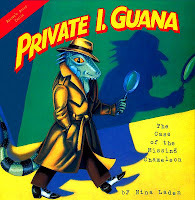 We kicked off our unit in the library by reading Private I. Guana, by Nina Laden - it was such a fun picture book that really set the tone for reading mysteries. Kids (and parents) who love word play and puns will especially like this book. Can Private I. Guana help find Leon, the missing chameleon? It's tricky, finding an animal that can change colors at will. But this ace detective searches high and low, until he comes across the Lizard Lounge - a slimy sort of place, where only the most cold-blooded reptiles hang out (pause, get it - cold-blooded reptiles?). Yes, this book was full of puns like that. We had fun talking about the different meanings. I have to tell you, the best part of reading this was telling the kids how much fun it is reading mysteries more than one time. It wasn't until my 3rd time reading this, that I got the joke that Leon's name is part of the word chameleon. They loved that - that they got something before I did. It also let me encourage them to reread mysteries they loved in 2nd grade, like the A to Z mysteries. Now that they're stronger readers, they'll pick up more of the clues along the way. It can really help readers' fluency to reread favorite books. They can then use these strategies to read new books. Chet Gecko series, by Bruce Hale - kids who like puns, jokes and the tone of Private I. Guana will love the Chet Gecko series. Just wait until they find out the Chet is the finest detective lizard at Emerson Elementary! This is great for 3rd and 4th graders who want to get into a new series that makes them laugh, but also solve crimes along the way. A to Z Mysteries, the A to Z Mysteries Super Editions, and the Capitol Mysteries, by Ron Roy - our 2nd and 3rd graders love getting into these mysteries. They have just the right blend of consistent characters and engaging plots. Dink, Josh and Ruth Rose are 3rd graders who know just how to solve their town's mysteries - with some good sleuthing and clever thinking. In the longer "Super Editions", the kids travel to new places for some exciting adventures. Joe Sherlock, Kid Detective, by Dave Keane - I had a lot of fun reading the Joe Sherlock mysteries. Joe's a kid I could relate to. No matter how hard he tries, he keeps bungling things up. Dave Keane mixes in lots of jokes, absurd situations and plenty of laughs in this series for 2nd and 3rd graders. Amazon is listing this as only available for the Kindle right now, but it would work just fine on a Kindle if you're traveling and want a funny mystery. "When Geronimo's sister, Thea, is invited to teach a journalism class at a college on Mouse Island, she has no idea that she's going to be called on to help solve a mystery. But when a student disappears, it's up to Thea and five of her students to find out what happened. A nail-biting mystery ensues, complete with secret passages, underground tunnels, and more than a few surprises along the way. Readers will love following the clues to help Thea and her new friends through their first adventure together!" What are your favorite mysteries to read with your children? I'm especially looking for picture book mysteries to read aloud so we can talk about how we read mysteries. Just last weekend, my youngest told me I needed some "outside time" and we were going to go garden. She dug out the gardening gloves, shovels and seeds. Yes, she's one determined young 7 year old who know she needs to lead the way and claim her mother's attention. Children have an innate sense of the seasons and they marvel in the magic of watching a plant grow. In many ways, it's a microcosm of all the changes their little bodies are going through. And Then It's Spring, by Julie Fogliano and Erin Stead, is a beautiful, beautiful new book that celebrates this magical change in a wonderfully quiet way. A young boy waits and waits for winter to end, with quiet determination of a young boy who knows that if he can just wait long enough, change will happen. With spare, poetic text, Fogliano conveys the quiet waiting as winter keeps its hold on the earth. With just a few phrases on each page, the measured pacing of this book makes the reader slow down and notice the world around, as the anticipation builds. This works beautifully either as a read aloud - the illustrations draw listeners in with their large blocks of color, even from afar - or as a quiet book to read by yourself, pouring over each illustration. Erin Stead uses woodblock prints and colored pencil, the same technique she used with her Caldecott winning book A Sick Day for Amos McGee. Her soft palette helps create the sense of quiet waiting - this winter is not dreary, but still, as if on the cusp of something about to change. The wide open spaces created by the fields, the sky and the clouds give a peaceful quality to the images. 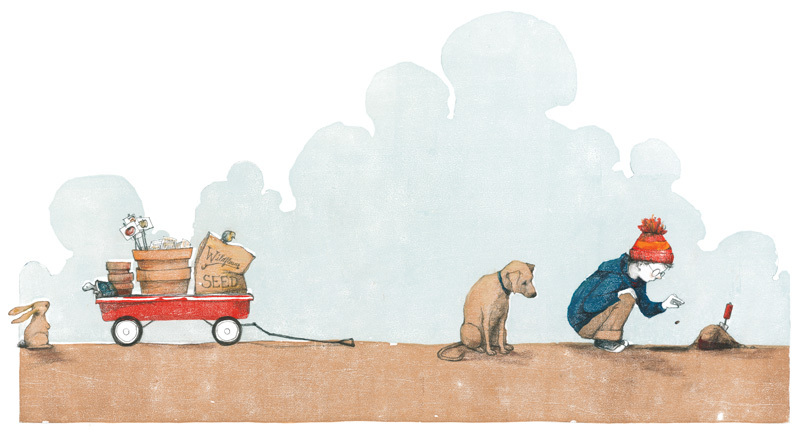 The pencil drawings of the busy animals draw the reader’s eye to notice small details in every page. The climax will bring smiles and satisfaction, as green spreads across the hills in a sure sign that spring has come. I have been waiting and waiting to share this book ever since it took my breath away the first time I read it last summer. It was released last week, and already people are talking about it. It is truly special. The review copy was kindly sent by the publisher Neal Porter / Roaring Brook Press, an imprint of Macmillan. If you make a purchase using the Amazon links on this site, a small portion goes to Great Kid Books (at no cost to you!). Thank you for your support. As our country celebrates President's Day, I would love to share my favorite book about Abraham Lincoln: Abe's Honest Words, by Doreen Rappaport and Kadir Nelson. This stirring book captures the span of Lincoln's life, the strength of his words and convictions, and the dignity in his stance - all in a way that a child just growing into an awareness of our nation's history can grasp. It is a beautiful book, one that you'll want to have at home to come back to again and again. Starting with Lincoln's humble beginnings, Rappaport traces his journey from the rural slave state of Kentucky to the statehouse in Illinois, to the nation's capital. Kadir Nelson's illustrations draw immediate attention and make this a wonderful book to read aloud to younger children. He expresses so much of Lincoln's character, whether it's as a determined lawyer working late into the night by candlelight, or looking up at him as he gives the Gettysburg address. Nelson's illustrations complement Rappaport's text on each page, conveying the scene Lincoln describes seeing slaves chained as he worked along the Mississippi River, or the steely gray scene of the U.S. Capitol during Lincoln's second inaugural address. "Lincoln believe that true liberty could not permit slavery. He decided to use his wartime powers as commander in chief to end slavery. In the third year of the war, he issued the Emancipation Proclamation. It freed over three million black men, women, and children and called for black men to join the Union army." While Rappaport does not provide the sources for each quote, readers will be very interested in the materials she provides for further investigation: a timeline, recommending reading for children who want to learn more about Lincoln, and selected research sources. If you live near Northampton, Massachusetts, make sure to visit the R. Michelson Galleries, which has a special display of Kadir Nelson's work this month. As the announcement on the Children's Book Council page states, "One of the preeminent artists working today. Nelson is a two-time Caldecott Honor Award winner, an NAACP Image Award winner, and a four-time Coretta Scott King Award Winner, including the 2012 Book Award.R. Michaelson Galleries will be exhibiting a selection from a half dozen Nelson books, including his collaborations with Spike Lee, and work from Abe's Honest Words, the Life of Abraham Lincoln." The Cybils Awards have been released today - have you gone to their site to see the great books the panelists have chosen? Really, head right over there now! This award honors children's and young adult books that combine literary excellence with kid appeal. And they consistently point me in the right direction when it comes to finding books for my students. No one will be able to resist lovable, furry old Grover in this giggle-inducing book app, based on the 1971 classic Golden Book. Sesame Street and Callaway Digital Arts hit all the notes perfectly from the opening pages, as Grover draws the reader in with his charm and natural humor. From that point on, no matter what age you may be, you will laugh, smile, and read along while Grover tries his best to keep you from turning yet another page. 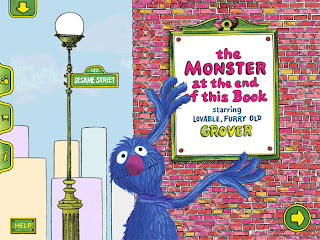 Emerging readers will follow the highlighted words as Grover speaks. Little fingers will tap the screen, discovering ways to untie the ropes and knock down Grover's brick wall, undoing each of his creative attempts to stop you turning the page. This app is perfect for preschoolers, but Grover’s silly voice and the engaging interactive features make it fun for all ages. Head over to Katie Davis's site to listen to her podcast: Brain Burps About Books. Today for she's sharing an exclusive interview I had with Sylvia Vardell, one of the Cybils panelists in this new category. As book lovers, we know about how the setting of a book can sweep you away to far-away places. Whether it’s the way that Anne Ursu pulls us into the magical winter landscape of the Minnesota woods in Breadcrumbs or the way Jennifer Holm makes us feel the dirt between our toes as we walk barefoot with the Diaper Baby Gang from Turtle in Paradise -- setting is a critical part of the books we love. But there’s another magical part of setting - and that’s the magic of the place where we read and fall in love with books. I find a visceral attachment to the place I’ve read my favorite books. Whenever I think about reading Rebecca Stead’s amazing When You Reach Me, I think about the dark summer night I spent on the couch in our mountain cabin - all alone in the wee hours of the night, getting to the ending and wanting to start right back over again. We bring books wherever we travel. My children laugh and tell stories about how their suitcases are so heavy because, “Mom insists on bringing 15 books on our summer vacation.” But just look at the fun I had with my youngest daughter reading Kate Messner's Marty McGuire on our summer hike in the Sierra Mountains! Head on over to the Nerdy Book Club today to read more of my thoughts on the Magic of Place, and leave a comment about your own special book reading spot. I want give special thanks to both Laurel Snyder and John Schumacher (a.k.a. Mr. Schu) for inspiring this post. They both enliven and deepen my reading experiences every day. The Cybils are coming, the Cybils are coming! I'm so excited to see the announcement of the Cybils winners this week. The Cybils Awards honor children's and young adult books that combine literary excellence with kid appeal. As the Cybils website states, "If some la-di-dah awards can be compared to brussel sprouts, and other, more populist ones to gummy bears, we’re thinking more like organic chicken nuggets. We’re yummy and nutritious." I love this award because the panelists continually bring to my attention books I hadn't heard of, and they celebrate so much of what I value in children's literature. The Cybils also celebrate many genres of children's literature. There are different awards for graphic novels, poetry and chapter books - all genres that are not typically included in the major children's literature awards. The panels have been hard at work evaluating the finalists, discussing the merits of each book and making hard choices about which one they all agree upon as the best in its category. The Cybils winners will be announced this Tuesday, February 14th. This year I have had the honor of coordinating the Book App category. We've had fantastic members of each panel, and they've evaluated over 50 book apps. They've considered the stories, the interactive features, the audio narration and the overall kid appeal of these apps. We've had fascinating discussions, and I think we've all learned something from the process. As Sondra Eklund wrote about over at the ALSC blog, definitely check out the list of Cybils finalists for suggestions on books for your children, students or patrons. Here are the links to the individual categories. And be sure to check in on Tuesday morning for the announcements of the winning books! Shelley Sommer's biography Hammerin' Hank Greenberg was named a 2012 Sydney Taylor Honor Book by the Association of Jewish Libraries, for its authentic portrayal of the Jewish experience. I have the great fortune today to be part of the Sydney Taylor Book Award Blog Tour, and am sharing an interview with Shelley Sommer. Shelley Sommer is the Library Director at the Inly School, a small independent school in Scituate, Massachusetts. Her previous book was John F. Kennedy: His Life and Legacy. In Hammerin' Hank Greenberg, Sommer follows Greenberg's baseball career from his childhood in New York, through his professional career in the 1930s and '40s, integrating a strong sense of American history during this time period. I was particularly struck by her use of primary sources, and so wanted to ask her about her research process. MS: How did you come to choose Hank Greenberg as your subject? Was there something that drew you to the American 1930s in particular? Or were you first drawn to baseball, and then to Hank's story? SS: I was drawn to Hank Greenberg’s story for a combination of reasons. It began with my son, who was twelve-years-old when I began thinking about this book. At the time, he was playing lots of baseball, and by extension reading baseball books. Because I manage a school library, I brought books home to him and, of course, we visited our local library. As I looked through my son’s books, I noticed Greenberg’s name several times and began reading more about him. I was intrigued by his story and wondered why he isn’t better known. The combination of his personal story and the times in which he played are fascinating – the son of Romanian Jewish immigrants working hard to succeed in the quintessentially American game at the same time that Jews in Europe were systematically losing their rights. Interesting stuff. We are baseball fans – the Red Sox, of course – so between our interest in baseball, an immediate curiosity about Greenberg’s story, and my understanding (through working in a school library), of how much kids love to read about someone who has overcome challenges all made Hank Greenberg the perfect subject. MS: Your previous book was about John F. Kennedy. How does writing about a sports figure compare with writing about a president? SS: Writing about a president and a sports figure are obviously dramatically different projects, but in both situations, it was the history of the times that interested me. Quite honestly, the biggest difference for me was that in the case of President Kennedy, I knew the story really well before ever writing the first word. The Kennedy biography grew out of my 15-year career at the John F. Kennedy Library in Boston. I literally talked and wrote about my subject every day before writing a book about him. After leaving the Kennedy Library, I began my graduate work at the Simmons Center for the Study of Children’s Literature. As part of my course work, I took a non-fiction class which resulted in my biography of President Kennedy. The Greenberg book was a totally different experience. I had to start at the very beginning. Literally, the first I heard of him was through my son’s baseball books. The learning curve was much steeper! That being said, it was also rewarding in a different kind of way. I was discovering this person and every anecdote I read was new and exciting. MS: What is your research and writing process like? Do you work from an outline? Copious notes? How do you decide to organize your material? SS: I organized my notes in a pre-internet way! I write note cards, use different colors of post it notes, and write on legal pads. At one point, I remember looking at some online tools that were recommended by friends and students, but I didn’t like having lots of documents open on my screen. I prefer to see my work right in front of me - on the floor in chronological stacks of papers and articles. I began by ordering lots of used books about Detroit and the Tigers and Jewish athletes. I also watched a really good documentary about Greenberg, The Life and Times of Hank Greenberg by Aviva Kempner (1998). After writing the first draft – which served as kind of an outline – I began working closely with my editor, Carolyn Yoder, on the subsequent iterations of the book. 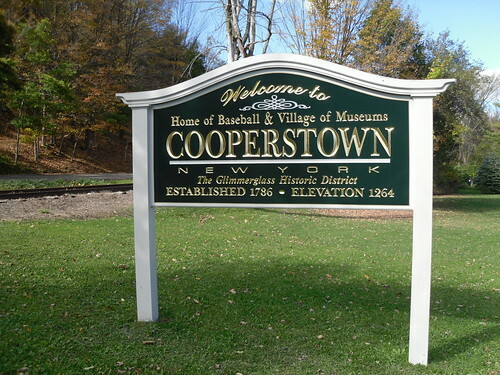 One of the most helpful resources was the research department at the National Baseball Hall of Fame in Cooperstown, New York. They had a file containing hundreds of newspaper articles from Greenberg’s seasons with the Detroit Tigers. The articles were invaluable primary sources and a lot of fun to read. MS: I loved the section at the end: "Hank Greenberg names his own all-star baseball team". Where did this come from? It's so much fun and really leads kids into exploring other players! SS: Hank Greenberg’s “own All-Star baseball team” is one of those treasures from his Hall of Fame file. I found it in the middle of a stack of newspaper articles and immediately knew it should be included. It is my son’s favorite part of the book! MS: Your source notes and back matter are very interesting and helpful to children interested in pursuing this topic more fully. What was using the Baseball Hall of Fame archives like? Do you have to be an author, or could a child access these if they were interested in learning more about a particular player? SS: The Hall of Fame is a wonderful place to visit - in person or online. Their web site is: www.baseballhall.org The best part about going to the Hall of Fame is its idyllic location in Cooperstown, New York. As many others have pointed out, Main Street in Cooperstown is like a Norman Rockwell painting that has come to life. My husband, son and I spent a few days in Cooperstown during the writing of Hammerin’ Hank Greenberg. While I was looking at the Hall of Fame’s photo archives, they enjoyed going to baseball-themed restaurants and ordering sandwiches with names like the Home Run Hamburger or the Grand Slam Grilled Cheese! You can also access the Hall of Fame’s research center online. They have information about every player who has been inducted – all 297 of them. Anyone can access the actual library in the Hall of Fame, but you need to schedule an appointment first so that the research staff is available to assist you. MS: I'm wondering about Greenberg's legacy extending into baseball today. How did his leadership affect Jewish ball players, not just of his time but today? I don't follow baseball closely - are there many Jewish players in the National or American Leagues today? Have opportunities opened more since Hank's time? SS: I’m not certain how many Jewish baseball players are currently playing for a major league team, but I do know that one of the most prominent is Kevin Youklis who plays for the Boston Red Sox. I feel a connection with Youklis because, like me, he is a transplant to the Boston area from Ohio. He grew up in Cincinnati – right down the road from my hometown, Dayton, Ohio. MS: Thanks so much, Shelley, for spending the time with me here. Right from the beginning, I felt a great connection with you. We're both librarians, and I also used to teach English and literature for middle school students. Best of luck with your future projects. SS: Thank you, Mary Ann, for having me. It was a pleasure! I would especially like to thank the committee members of the Association of Jewish Libraries for continuing to choose wonderful books to honor with the Sydney Taylor Book Award. A baseball fan, I'm not; but I always seek out biographies that will capture students' interests. So I was excited to read a new biography about Hank Greenberg, America's first Jewish baseball star. Shelley Sommer's Hammerin' Hank Greenberg was recently honored by the Association of Jewish Libraries for authentically portraying the Jewish experience. Tweens and young teen baseball fans will be interested in the way Sommer weaves together American history from the 1930s and '40s with Greenberg's story. "'I don't think anybody can imagine the terrific importance of Hank Greenberg to the Jewish community, said one Detroit fan. "He was a God, a true folk hero.' Some Jewish publications began referring to Greenberg as the 'Jewish Babe Ruth'" (p. 44-45). Throughout this story of Greenberg's career, Sommer interweaves a backdrop of American history in the Great Depression and World War II. This is particularly effective for tweens who may have some understanding of American history, but who may not understand how it affected sports players. I was interested in the parallels Sommer drew between boxer Joe Louis's role in boxing, being a champion for African Americans, and Greenberg's role as a hero for American Jews. "Baseball is a game that affords any youngster an opportunity to progress. Ability is the sole determining factor in advancement, and not religion, the way your hair parts or your parental lineage." In a handwritten postscript, he added: "If prejudice does exist and I refuse to recognize that it does does, then let it spur you on to greater achievement rather than accept it and be licked by it" (pp. 104-105). For me, this sums up Greenberg's positive attitude, determination and dignity. He withstood jeers from opposing players, and kept playing his very best through hard times and good. The backmatter provides interesting insights into Greenberg's life and Sommer's sources. Baseball fans I shared this with were particularly interested in the all-star baseball team that Greenberg named, and wanted to know more about the other players he included. 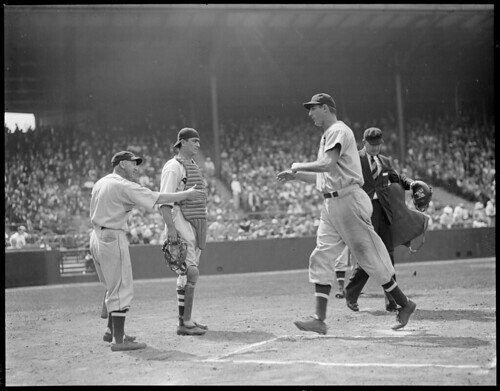 Sommer includes a list of further resources for readers to learn more about Hank Greenberg and the history of the times when he played baseball. She also includes a full bibliography and source notes. The one item I would have found useful is a timeline to visually integrate the different events described, both in Greenberg's life and American history. I am looking forward to interviewing Sommer this weekend as part of the Sydney Taylor Blog Tour. For more details see the Association of Jewish Libraries for their full announcement. The Nonfiction Detectives: "The many-layered book is more of an overview of Greenberg’s career. The author also highlights what it was like to be Jewish at a time when Anti-Semitism was escalating because of the growing turbulence in Germany that would become World War 2." ProseandKahn: "This is a comprehensive birth to death biography that is totally accessible to the middle school reader." The review copy came from our local public library. If you make a purchase using the Amazon links on this site, a small portion goes to Great Kid Books (at no cost to you!). Thank you for your support. Every year, I am excited to see the books selected for the Sydney Taylor Book Award by the Association of Jewish Libraries. This award "honors new books for children and teens that exemplify the highest literary standards while authentically portraying the Jewish experience." This award is in honor of Sydney Taylor, author of The All-of-a-Kind Family, a classic series about an immigrant Jewish family in New York City in the early 1900s. As Noah’s wife Naamah, a beautiful singer, calms the animals, her husband and children with soothing lullabies, she brings peace to the storm-wracked ark. Bartoletti's lyrical text is perfectly paired with Meade's collages. Children will love looking at all the animals in the ark, especially seeing them paired with different constellations in the night sky. I had so much fun reading this heartwarming, funny book this summer. Zelly Fried wants a dog more than anything, but her parents aren't convinced. When her eccentric grandpa Ace leaves her a note tied to an old orange juice jug, she's the one who isn't quite convinced. Ace has cooked up a plan for Zelly to have a "practice dog" to prove to her parents that she really is ready to take on the responsibilities of owning a dog. Zelly's family is one of the few Jewish families in her Vermont neighborhood, and her grandfather's dialog is full of Yiddish phrases. Sommer weaves together the story of Hank Greenberg, the first Jewish baseball star, with the history of America during the 1930s and 1940s in this accessible biography for tweens and teens. I really enjoyed reading this biography, and will review it in depth tomorrow.